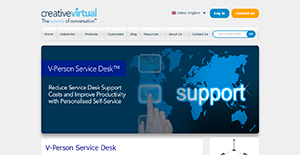 What is V-Person Service Desk? V-Person Service Desk is a machine learning and AI-powered self-service support portal for a company’s employees. The virtual agent system immediately supplies personalized answers to questions stated in natural language so that workers get the exact support they need. With V-Person Service Desk, businesses can reduce the rates of calls to their in-house support center. Since employees can adequately troubleshoot problems by themselves, they can work more productively and more efficiently. Moreover, companies can count on Creative Virtual to offer them support whether they choose to manage the system by themselves, have the service manage it for them, or combine both. V-Person Service Desk provides employees with immediate assistance should they need it regardless of their preferred device. The virtual agent understands and processes natural language and offers answers tailored to the needs of the person making the query. This reduces the rates of call deflection and decreases the number of live chat sessions. Instead, employees can troubleshoot issues themselves at a faster rate, leading to enhanced productivity and efficiency. V-Person Service Desk easily integrates with a company’s existing systems such as ticketing solutions, single sign-on services, live chat operations, and databases. This allows the Creative Virtual system to tap into these applications to enhance their service provision as it can draw essential information to create a personalized support experience. In case the employee does not get the answers they need to solve their technical problems, the virtual agent can handover the issue to a live agent. This can be inefficient in other cases but not with V-Person Service Desk. The virtual agent passes on the conversation to the live agent who will assess the issue and offers a tailored support. V-Person Service Desk enables organizations to smoothly manage the flow of knowledge resources and deploy virtual agents where they are most needed from a single console. On top of that, they can integrate editing, reporting, and testing functionalities with the system. If you are considering V-Person Service Desk it could also be sensible to examine other subcategories of Best Artificial Intelligence Software gathered in our database of B2B software reviews. There are popular and widely used systems in each software group. But are they essentially the best fit for your enterprise’s special wants? A popular software solution may have thousands of subscribers, but does it offer what you need? For this reason, do not blindly spend on popular systems. Read at least a few V-Person Service Desk reviews and consider the aspects that you want in the software such as the price, main functionality, available integrations etc. Then, choose a few solutions that fit your requirements. Check out the free trials of these apps, read online reviews, get explanations from the maker, and do your research meticulously. This exhaustive research is sure to aid you select the best software application for your firm’s unique requirements. How Much Does V-Person Service Desk Cost? V-Person Service Desk is a self-service desk for workers. Companies interested in integrating the virtual agent into their ecosystem can request for their enterprise pricing via phone or email. We realize that when you make a decision to buy Artificial Intelligence Software it’s important not only to see how experts evaluate it in their reviews, but also to find out if the real people and companies that buy it are actually satisfied with the product. That’s why we’ve created our behavior-based Customer Satisfaction Algorithm™ that gathers customer reviews, comments and V-Person Service Desk reviews across a wide range of social media sites. The data is then presented in an easy to digest form showing how many people had positive and negative experience with V-Person Service Desk. With that information at hand you should be equipped to make an informed buying decision that you won’t regret. What are V-Person Service Desk pricing details? What integrations are available for V-Person Service Desk? If you need more information about V-Person Service Desk or you simply have a question let us know what you need and we’ll forward your request directly to the vendor.